Finally, an easy way to keep your air compressor tank drained! 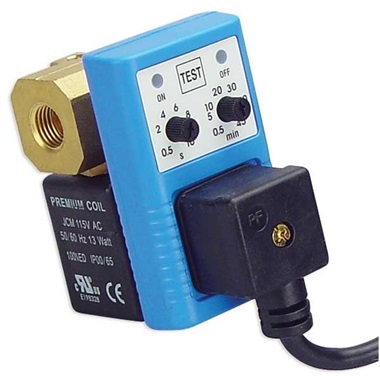 115 volt electronic valve has timer to schedule drain and discharge times. Set valve to release moisture in tank every 1-45 minutes. 2nd setting allows you to set how long you want valve open (0.5-10 seconds). Makes tank last longer and helps eliminate moisture in your air lines. 1/4" NPT inlet and outlet. Max pressure 230 psi. Plugs into 115 volt outlet.